An aged khaki terra cotta. An Iron Age style oil lamp replica, made in the Jewish city of Hebron, at the heart of the Judah mountain region in the holy land of Israel. The Iron Age Oil Lamp gift is a great solution for how to light the house in an authentic way. This gift is great for romantic lighting, for Shabbat candle lighting, for oriental lighting, for authentic lighting and for a house aged ornamentation object. This gift is an invitation to enjoy the same lighting Biblical Persons enjoyed from. Enjoy the light of King David, King Solomon, King Saul and much more. And you shall command the people of Israel that they bring to you pure beaten olive-oil for the light, that a lamp may be set to burn continually. Exodus 27: Your eye is the lamp of your body; when your eye is sound, your whole body is sound, your whole body is full of light; but when it is not sound, your body is full of darkness. (Luke 11:34); He was a burning and shining lamp, and you were willing to rejoice for a while in his light. (John 5:35); And night shall be no more; they need no light of lamp or sun, for the Lord God will be their light, and they shall reign for ever and ever. (Rev. 22:5). Lamps appear in the Bible as lighting the way for the righteous, the wise, and for love and other positive values. While fire was described in the Bible as being destructive, light was given a positive spiritual meaning. The oil lamp and its light were important household items in Biblical times, and this may explain their use and connotations in the Bible. 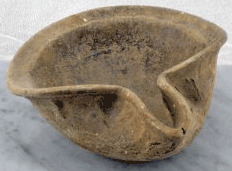 Oil lamps were used for many spiritual rituals. They were buried with the dead to comfort the soul and to light the way to the hereafter. They lit the interior of dark tombs. Lamps were used to honor the memory of the deceased as well as acting against evil spirits. The oil lamp and its light also became important ritualistic articles with the further development of Jewish culture and its religion.